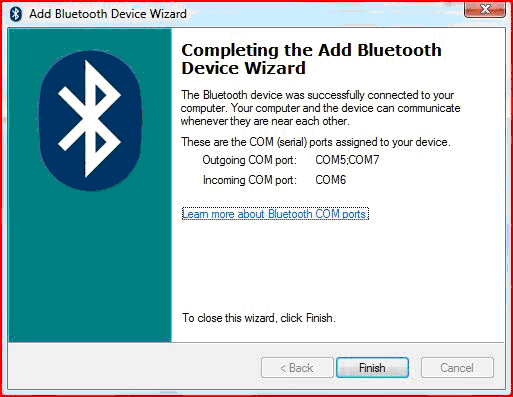 Today we will show you how to setup a Bluetooth connection in Windows. This can be done either by connecting from an external device (like a mobile phone) to a laptop that has Bluetooth built-in, or by connecting from that external device to a laptop or PC with the help of a Bluetooth dongle. 1. Insert your dongle into an USB port. 2. 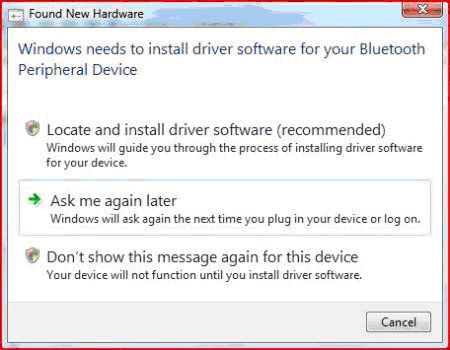 Wait for Windows to detect and install the device driver software. 1. First you'll need to turn on your Bluetooth peripheral and set it into pairing mode. Usually you can do this by pressing and holding the Bluetooth button until you see a flashing light that tells you the pairing is ready. 2. Now open the Settings app. You can do this by clicking the search icon in the taskbar and searching for Settings. 3. Next go to Devices and then go to Bluetooth. 4. Turn Bluetooth on if it's not turned on already. 5. Select the device you want to connect and click Pair. After pairing is done, it says "Connected" under the device name. 1. If the connection is not already active, you'll have to enable Bluetooth on your PC/laptop. By default, the wireless and Bluetooth connections are active. If for some reason they are not active, look for a button on the front face or on the sideways of your laptop that should enable both wireless and Bluetooth connections. If you can't find that button please read the laptop's manual to find it. 2. Go to "Start" -> "Control Panel" -> "Network and Internet" and choose "Set up a Bluetooth enabled device". 3. In the Devices windows, click on "Add..."
4. Check the option "My device is set up and ready to be found" and click the "Next" button. 5. Windows will show you all active devices. Select the device you want and click "Next". 6. 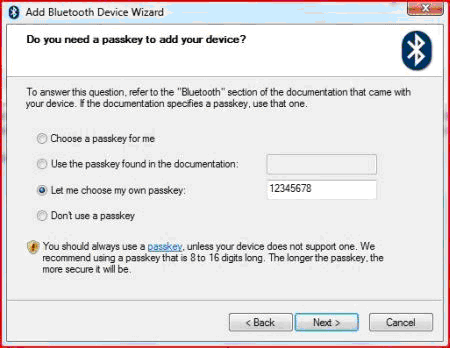 Now, Windows asks you to set a passkey. You can let Windows choose one for you, you can enter the passkey found in the documentation of your device or you can enter your own. Also, you have the option of not using a passkey. 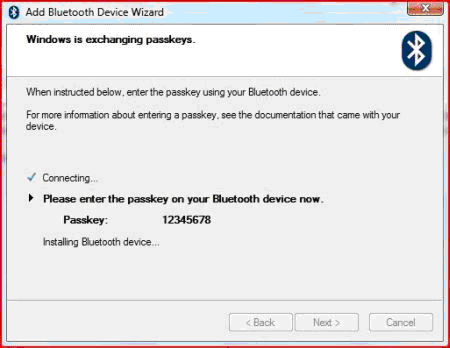 A passkey is used to make the connection between the external device and your PC/laptop more secure. Select the option you prefer and click the "Next" button. 7. 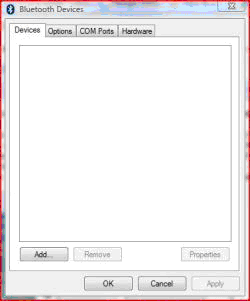 On your external device a dialogue box should appear asking for permission to connect to the PC/laptop. Select "Yes" and enter the same passkey you have entered earlier. 8. A window will pop-up saying that new hardware was found. Choose "Locate and install driver software". 9. If you have a CD that came with your external Bluetooth device you will have to insert it in your CD-ROM or DVD-ROM. 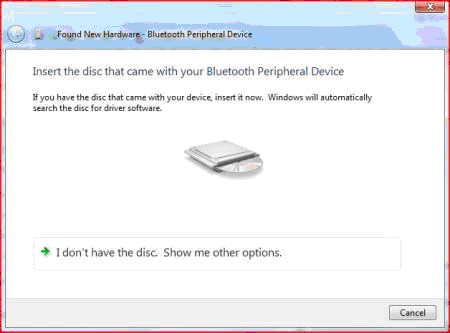 After you insert the CD, Windows will be able to finish the driver installation. If you don't have a CD choose "I don't have a CD. Show me other options". Windows will try to find a suitable driver for you. Even though it won't be able to find such drivers, don't worry too much, there is still a chance that your Bluetooth connection will work. 10. That's it. Click the "Finish" button and test your connection. The best way to test your Bluetooth connection is to send a picture or a file from the external device to the laptop and then from the laptop to the device. To do that, just select the picture you want to send, right click on it and select "Send to" and then "Bluetooth device".. 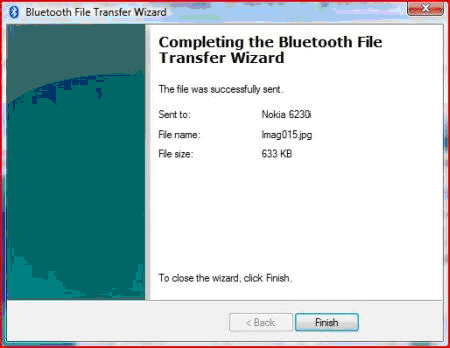 The "Bluetooth File Transfer Wizard" will pop up. Click on "Browse". Select the external device you want to send the picture to and click the "Next" button. On your external device you will receive a warning saying that you are about to receive a file. Choose "Yes" and the transfer process will start. After the transfer is complete, press the "Finish" button and that is it. To send a picture from your external device to the PC/laptop, go to your taskbar and right click on the Bluetooth icon and then choose “Receive a file”. Now, from your device, find a picture or file and send it to your PC/laptop. The PC/laptop should be identified as an active terminal, select it and the transfer should start. For this tutorial we used the following hardware: HP Compaq nx7400 with HP Integrated Bluetooth module, HP Compaq nx7400 with Hama Bluetooth USB Adapter Class 1, Nokia 6230i . what comes to vista network "Control Panel" -> "Network and Internet"
It depends. 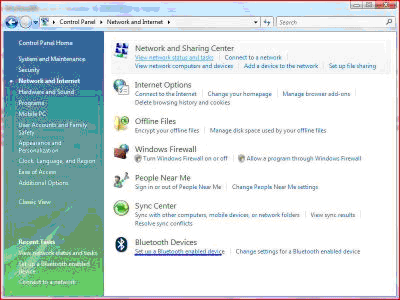 If you use the default view for the Control Panel in Windows Vista, you will find the section "Network and Internet". If you use the classic view in Windows Vista you won't see it. That sure is strange. 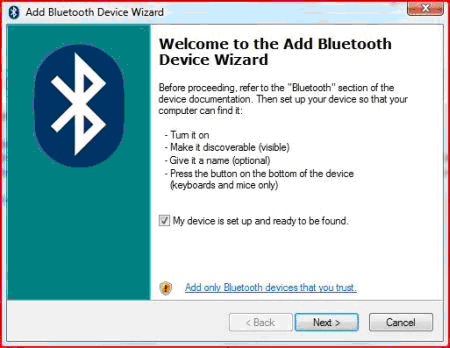 Try to reboot your PC after the Bluetooth Device is installed. Maybe, after the reboot Windows will load the Bluetooth applet in Control Panel. Can't install my bluetooth device _ HELP!!! I am having exactly the same problem as you -I have done everything you described and have updated drivers - when I check the properties of the dongle in the device maanger it says it is working but I do notehave the bleutooth option in the list on the Control Panel /Network - Internet page - it just stops after Synch Centre. Have you resolved your problem and could you - or someone - please help me resolve mine? I have already tried restart , whihc didn't help at all, except that there is a bluettoth icon on my desktop now. I can't find Bluetooth in that list on my PC. There's everything else, it's just the Bluetooth thing that's missing. Is this normal? There is an "Network and Internet" option in Control Panel in my version of Vista - maybe you are showing classic view, or perhaps you aren't looking in Control Panel. But I assure you it is there. Are you sure you have Bluetooth on your laptop? If you have it, did you install the drivers? Hi i hi i have compaq lap top which has windows vista installed,but its giving problem with bluetooth,it has builtin bluetooth. the error msg was cannot find the device,ie its not able to detect the device even though the my mobile has bluetooth and it was also enabled. - If your using 3rd party software/drivers, you may be prompted to "Authorize/Allow" the device to always connect when in range. - If you change the device ID on your phone/device you will need to create a new partnership. - If you change your computer name (System. Advanced settings, computername) you will need to change the partnership name for your comp. Or create a new partership. Try to enter the PIN of your PDA. If you didn't set one, try to search for a default PIN used by the PDA's manufacturer, or enter a PIN of your choice. Also, you can search trough the PDA (manual) for PIN settings and adjust them accordingly. I am able to send file from my Vista laptop to Sony erricsson k750i mobile, but my mobile is not able tos end any file to laptop. I don't know why I have to "Search" every time to allow my Dell M1730 to talk with a Dell Bluetooth Travel mouse. I have posted a query on Dell forum but it looks like no one can answer this. 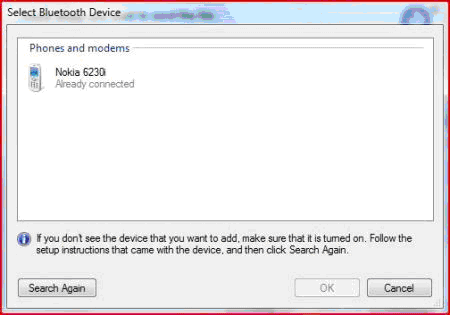 I am desperately looking for help to set up the bluetooth devices on my PC . 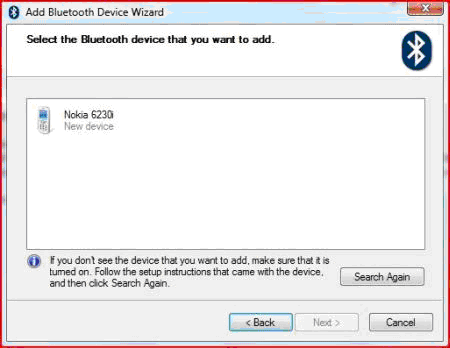 In fact I've looked everywhere but there is no option at all showing Bluetooth, as my PC doesn't have one integrated. What should I do to set up this bluetooth program? You need to buy yourself a Bluetooth® USB Adapter and plug it into your computer. I have an HP laptop with integrated Bluetooth, but it can't find my phone. I made sure they're both on and visible. I also can't open the Bluetooth settings. When I click on "Bluetooth devices" nothing happens. I have a bluetooth on my pc but it doesn't work. I tried to add my mobile to devices but it could't find it. I use windows vista home basic & hp pc. What is wrong? I have Nolia 6600 and Lenovo Y500 seires laptop. i managed to pair up the cell with the laptop. Am using Blue soleil (BS) for this purpose. When I click on the telephone icon in BS, it is supposed to dial up for connection to internet. BUt here I am facing a problem as it immediately says "Connectio failed"
I am not able to understand what is missing. Are there any settings which need to be done in laptop!!!!!! Am using laptop for the first time so am unware of any such settings. 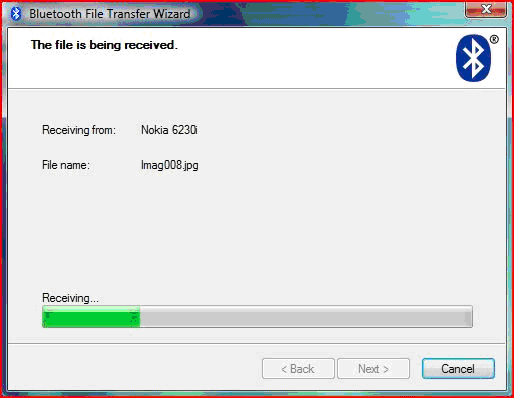 Earlier I used to access net thr the same cell Nokia 6600 and BS on my desktop which never gave me any problem. hey, it is really helpful up there with the tutorial. This is the 2nd time doing this setup. some problems occur. hey yea...so i've installed everything...as in not from outside as such but it was already there i started it and it was searching for connections , it even found my mobile bluetooth (sonyE) BUT when we click on "connect" it appears as "Connection FaileD" BUT the mobile can still send things to the computer (Toshiba laptop btw) and since the SE phone has a "remote control" feature i've used it on an acer laptop and it connects and works FINE but i cant seem to control the toshiba one..help anyone? How do i control the laptop thru the phone and how do i get the laptop to connect BACK to the phone? I need to know how the connections should be made for a wireless device which is used to receive the signals from Satellite and communicates with the laptop for GPS purpose. iam using vista on my laptop and when i tried to connect the device with my laptop it doesn't detect the receiver and with this problem i cant use the product with my laptop. so kindly provide me the solution for this problem and suggest me where i can get the drivers for this. I have tried every possible configuration to get my Windows Vista Ultimate Asus computer to communicate with my new Blueant T8 micro bluetooth headset to no avail. The T8 device is simply an earpiece, there is no driver software that I can find, and I can't enter a password from the device to the computer for obvious reasons, although I can enter a password into the computer. What am I doing wrong? The computer tells me that the communication is activated but I get nothing in the earpiece. From one laptop to the other, but not the other way? I have two laptops, one running XP one running Vista. Bluetooth is working, connections are made. I can send files from the XP to the Vista but not the other way. My Vista one lets me select the file, then select the paired laptop, it start to 'push' the file, then stops. A bubble at the bottom pops at the bottle titles Bluetooth, "This service is not available"????????????????? Anyone, please help, any ideas ??? my lenovo laptop is blth enabled and it was working fine. I didnt know how to conect to Internet using blth mobile. Phone memory folder in "my computer"
Earlier when I set up my bluetooth connection and paired it with my phone. Vista showed my phones folder name in "My Computer" with other icons like C: etc. But it doesnt show now , I dont know why. I have tried to reinstall connection and repair many times but still the icon has some how sort of diappeared. It was much easier to transfer and delete files etc using that ftp connection built by Vista , rather than the very cumbersome method described above. Please tell if some one knows the solution. everything goes as it does above, up untill your last picture when i'm trying to send images from my ericsson w810i to my vista desktop. 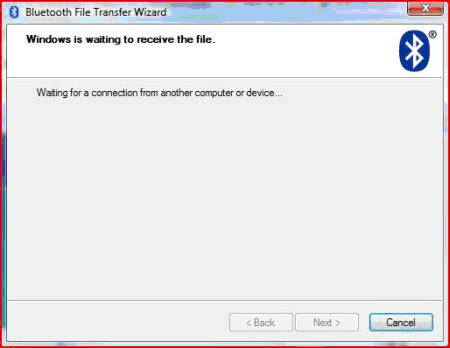 audio files go through with no problems, but with images i load up the wizard, get the connecting screen then i get the "cannot complete the file transfer wizard" screen where it says file transfer was unsuccessful and that it was not implemented. i get this everytime i try to send an image. i'm using a belkin F8T013 USB adaptor. Bluetooth File Transfer Wizard doesn't pop up! First of all, thank you for having this helpful information for us - this really helps! However, I got a slight problem that I don't know how to fix. 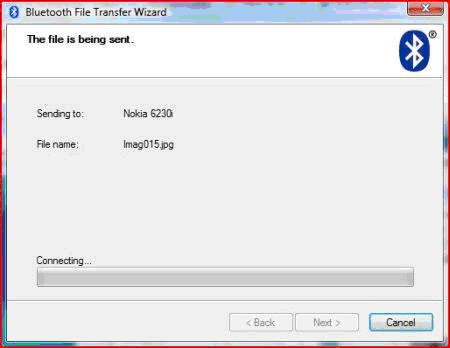 My bluetooth did pair with my Samsung mobile phone, but when reaching the stage of testing procedure, the "bluetooth file transfer wizard" doesn't pop up after I selected a picture in my laptop, clicked "Send to" and "Bluetooth device" respectively. Instead, it did work when I did it manually by right-clicking at the bluetooth icon at the bottom right and then "Send a file"
Do you know why this happens? Actually it's not a major problem, but sometimes I'd like to send a file right away at the file itself rather than clicking the bluetooth icon again. This becomes annoying when the sending files are in, let say, 5 levels sub-folders. You know what I mean? And, I use the Window Vista. Thanks a lot in advance! Would love some information thank you.